Seasonal dog controls change on 1 May. 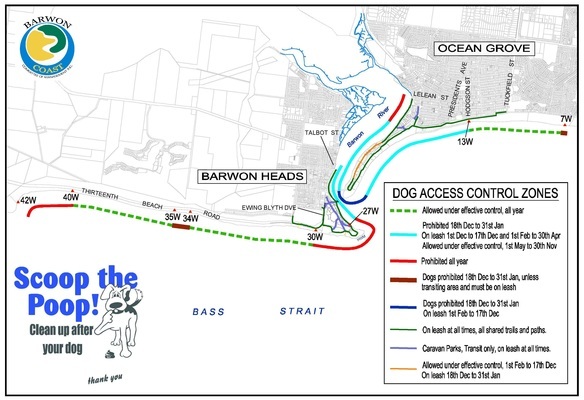 Seasonal dog controls for the Ocean Grove and Barwon Heads foreshore areas will change from 1 May. Regulations that govern where dogs can be walked on and off-leash within the Barwon Coast foreshore reserves change throughout the year. This allows for a range of beach experiences and also helps with managing the higher number of beach users through the summer months, Barwon Coast CEO Gary McPike said. From 1 May each year, changes come into place that allows dogs off-leash under ‘effective control’ in areas which restrict this use during the busier summer months. However, there are many areas where the regulations remain unchanged. “All dogs must still be on leash at all times when in car parks, trails, pathways or beach access ways. A dog must not be unleashed until on the sand in the approved off-leash zone,” Mr McPike said. “Barwon Coast staff often get asked what ‘effective control’ actually means. Essentially it requires the person in control of the dog to have a leash in their possession at all times; keep their dog in visual and audible range so they can effectively recall the dog; the dog must be recalled and restrained when approaching other dogs or people, unless permitted to approach by the other person; and dogs must not rush at, attack, bite, worry or chase wildlife. “Dog regulations are a key part of ensuring that everyone on the Barwon Coast can share our shores. Equitable access for all is a key Victorian government policy that Barwon Coast strives to achieve through our management of the foreshore reserve. Next articleDog park for Grove?